Gaining visibility into and control over the multitude of internal and external risks is one of the top priorities of corporations today. With a recent jump in regulatory mandates and increasingly active shareholders, many organizations have become sensitive to identifying and eliminating areas of risk — including operational, IT, brand, and reputation areas — from their business. For EHS Managers, reducing operational risks such as environmental & social risks, incidents and regulatory sanctions is a core component of any effective EHS strategy. 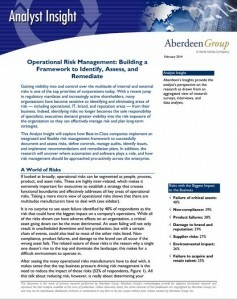 This 10-page study by Aberdeen Group will explore how Best-in-Class companies implement an integrated and flexible risk management framework. The research will also uncover where automation and software plays a role. Key recommendations for companies looking to improve their risk management.